Red Hood, the rogue Robin. Artemis, the exiled Amazon. Bizarro, the flawed clone of Krypton. Together, these three unlikely allies make up the DC Universe's "Dark Trinity." As the Outlaws, they've taken to the shadows to take down evil...from the inside. 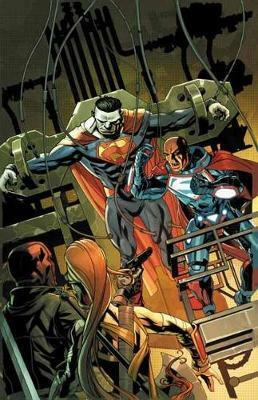 But when Bizarro gives his life in battle against a powerful villain, an even more dangerous enemy approaches: Lex Luthor, Metropolis' self-made, so-called Man of Steel. He has a plan to unleash a superior model of Red Hood and Artemis' strange teammate--a Bizarro 2.0, with a brilliant brain to match his unstoppable brawn. Now this new Bizarro and his allies will be put to the ultimate test. An army of Gotham City's greatest crime-fighters--Batwoman, Nightwing, Azrael, Clayface and more--are out to bring the Outlaws to justice. Can the Dark Trinity remain united? And can Bizarro's bizarre transformation possibly last? Find out in Red Hood and the Outlaws Vol. 3: Bizarro Reborn, an action-packed adventure from writer Scott Lobdell (Teen Titans, The Uncanny X-Men) and artists including Dexter Soy (Batman: Arkham Knight--Genesis), featuring the vigilante heroes of Batman: Detective Comics! Collects Red Hood and the Outlaws #12-18 and Annual #1.